Owls are a popular trope in the mythologies of many cultures, some of which believed that these nocturnal creatures were harbingers of impending death, with a mission to collect wayward souls. But don’t worry: we have it on the highest authority that this screech owl will not consume the very essence of your being. 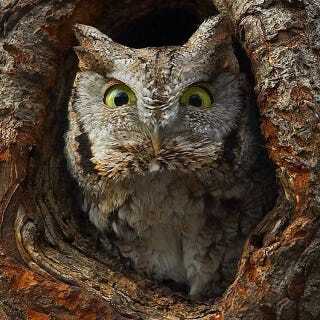 Screech owls are opportunistic predators. They eat whatever they can easily catch: mice, rats, birds, reptiles, insects, amphibians and fish. But we’re pretty sure human souls aren’t on the menu. So don’t worry about it. Your immortal afterlife is totally safe. Really.